One lucky travel agent has become the first to win a free cruise for two people with Fred. Olsen Cruise Lines as part of the company’s ‘Big Fred. Olsen Giveaway’ promotion. The incentive was launched at the Closer 2018 Trade Conference earlier this year, and gives UK travel agents the chance to win a car for Christmas, with a cruise for two also being given away every month until the end of the year. The winning agents can choose a cruise for two people for up to eight nights on any of our ships, including Fred. Olsen’s new river boat Brabant. The first winner, for the month of June, was Andrea Dixon of Broad’s Travel in Sutton Coldfield. “At Fred. Olsen Cruise Lines, we pride ourselves in bringing the world closer, and we simply wouldn’t be able to do that without the support of our fantastic travel agents. “What better way to reward them for all their hard work and commitment than by offering them the chance to join us on board, and enjoy one of the Fred. Olsen cruises that they so often sell to their customers. To be in with a chance of winning, all travel agents need to do is register every booking they make for Fred. Olsen Cruise Lines until 15th December. Every month we will pick a winner for a cruise, and at the end of the campaign one lucky travel agent will win a brand new Fiat 500. Photo caption:Andrea Dixon, left, is presented with her free cruise voucher by Head of Sales at Fred. 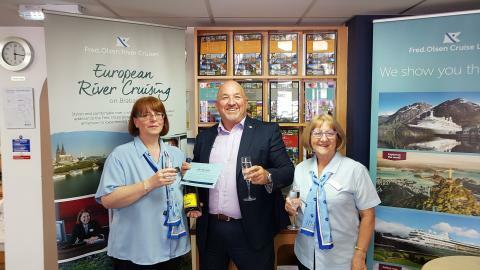 Olsen Cruise Lines, Mike Evans, alongside Isabelle Bending of Broad’s Travel in Sutton Coldfield. ​Fred. 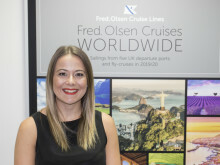 Olsen Cruise Lines has hosted its first dedicated travel trade conference in over a decade, at The Belfry Hotel & Resort in Sutton Coldfield, near Birmingham. The highly-successful ‘Closer 2018’ Trade Conference attracted over 150 delegates, from a wide range of travel agents and tour operators across the UK, as well as a number of non-UK resellers.